"Abraham Lincoln once said, “All that I am or ever hope to be, I owe to my mother.” Ben Carson added, I’m not sure I want to say it quite like that, but my mother, Sonya Carson, was the earliest, strongest, and most impacting force in my life." 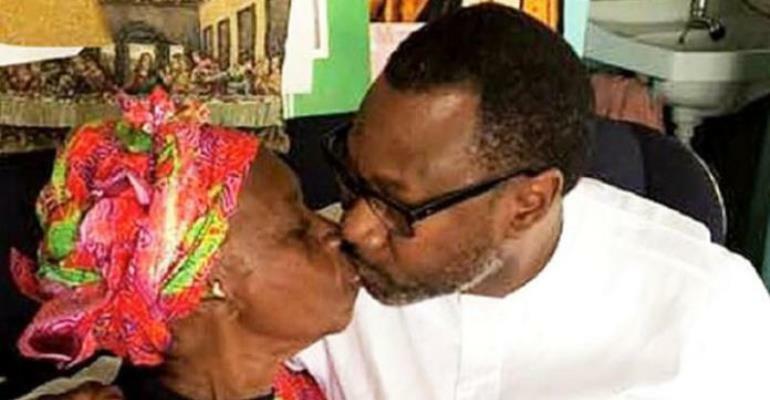 The oil magnet and billionaire chairman of Forte Oil, Femi Otedola did not kiss a mummy or lust to a kiss that should warrant the clobbering he has been garnering from some persons since a picture showing him kissing the mother was made public. According to a published text where the picture was attached, Otedola said that he would not have been what he has become today if not for the mother's stoical stance in making sure that he succeeds. So, he kisses the mother out of nonsexual love. Whatever the persons in this line of thought were thinking, kissing is not a bad thing. But like psychologists would say, nothing is bad but the heart makes it so. Conversely, many great men in the world who became successful out of their mothers' inspiration, guidance, and so on had done more than a mere kiss to their mothers. For example, Benjamin Solomon Carson Sr., popularly known as Ben Carson, a renowned American neurosurgeon born September 18, 1951, has not stopped praising the mother, Sonya Carson, in his four books: Gifted Hands, Think Big, The Big Picture, Take the Risk). Yours truly have read three of the books except ‘Take the Risk”. In these books, Ben praises the mother than is expected of any man in love with a woman. And he has been thankful to the mother whom her husband left two children to take care of, for another woman, when Curtis and Ben were but kids. The mother who merely had a sound education except for cleaning people's houses for a pay, was not deterred to be encouraging Ben with his low performance in the primary school. Ben said, "Part of Mother’s strength came from a deep-seated faith in God and perhaps just as much from her innate ability to inspire Curtis and me to know she meant every word she said. We knew we weren’t rich; yet no matter how bad things got for us, we didn’t worry about what we’d have to eat or where we’d live. "Our growing up without a father put a heavy burden on my mother. She didn’t complain — at least not to us — and she didn’t feel sorry for herself. She tried to carry the whole load, and somehow I understood what she was doing. No matter how many hours she had to be away from us at work, I knew she was doing it for us. That dedication and sacrifice made a profound impression on my life." So, Otedola’s kiss on the mother’s lips is acceptable and even expected of such an illustrious son. It is not what those saying it is immoral think. It is the kind of kiss that the bible Jesus exhibited to his disciples, to say the least. Otedola has every reason to kiss, caress and hug the mother for her positive influence mostly in his life. Some people like him can never forget the un-daunting zest their mothers deposited in them through life. Yes, women are naturally-muscularly feeble but you cannot limit the length their inner strength can go in the cause of raising their children and you cannot limit the level their children could go to reciprocate their love to them. This author has authored 582 publications on Modern Ghana. Akunyili, Bayero: So, Gov. T.a Orji Can Express Shock?